Bon Jovi's latest release, Burning Bridges, has now been released around the world. We know that at least some of the songs were written for previous albums and didn't make the cut. Here was Jon talking about Burning Bridges at a fan club gig just after Saturday Night Gave Me Sunday Morning first dropped. He said "there's no band stuff, don't look too deeply, it's not that" and now I think I know why. Many people have interpreted the title track as a parting shot at Richie Sambora. To me, it seems obvious that it's a dig at the record company. 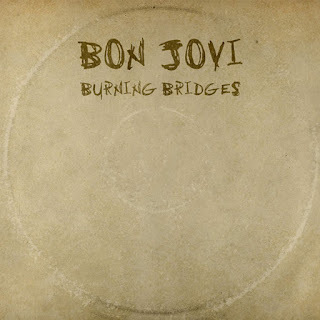 Especially since the band has done virtually no promotion for this album (Bon Jovi's Facebook page hasn't mentioned the album once), and Jon has downplayed it as a contractual obligation whilst insisting the "real album" is coming out in 2016. The two lines that give away the real target of this song are "Here's one last song you can sell" and "Hope my money and my masters buy a front row seat in Hell". Richie doesn't sell the songs, and he doesn't own the masters... but the record company does. You can stream Burning Bridges on Spotify if you don't have it yet. How would you rate the album? Do you have a favourite or least favourite song? I'm going out to look for it this morning. I haven't listened to any of the pre-released songs yet and basically forgot about it until some time yesterday due to lack of publicity about the record. And now I understand why. I guess they are splitting with the long-time record company? I'm kind of surprised Jon hasn't created his own label by now anyway since he's such a business mogul. I hope it's a decent record. I have NOT been enthused about it since I heard about the release, so I guess that's why I put it out of my mind. It makes me sad to not be excited about a release from my boys for the first time in 30 years. No word yet on whether or not Bon Jovi is changing labels or releasing their next record independently. It's not the first time they've had a dig at the label in a song ("This one is for the CEOs and record companies" - The More Things Change) but they've never been this, well, forceful about it. As for the album, it has its moments but I'm not sure how I feel about the songs yet. I got it this morning and have listened to most of it and I really like it. Mind you, one of my favorite records of theirs is HAND and I have never had a big problem with their musical changes over the years. It may not appeal to the folks who want the harder edge (like on These Days or Slippery) back, but on first listen I like it a lot. Some will hate it, some will love it, others still will merely tolerate it (liking some songs and not others) and hope for something "better" in 2016. I did take the lack of liner notes and lyrics in the CD as a bit of a one fingered salute to the record company though. Saying, "We have to put this out, but we're not going to give more than we have to." Yeah, I haven't had any problems with their direction in the last few years either. What About Now didn't really grab me, apart from a few tracks, but I loved The Circle, Have a Nice Day, even much of Lost Highway, etc. Their record company has canceled a preorder bonused poster in Japan, there is some strange release as well. ;( No more songs, decent booklet, promotion. Still waiting my JP copy. I rate 3/5 for advanced based of digital streaming channels. I find myself really liking this album, I was a little concerned and curious about the guitar sound without Richie but to my own surprise I think the guitar is awesome in pretty much all of the songs, where I am missing Richie a lot is in the back vocals though. I hope Bon Jovi haven't lost their masters.